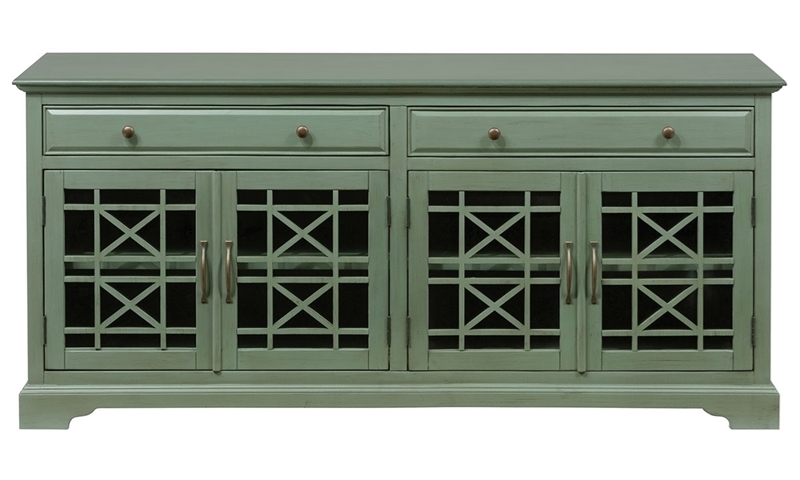 Accentuate your living room or den with this timeless Craftsman-style media console from Jofran in a fresh, slightly distressed jade green finsih. Its three drawers and cabinets offer versatile storage options. At 60-inches wide, it's the perfect size as a TV stand, with cabinets that can be used to house game consoles and satellite boxes thanks to a cable management point in the back. 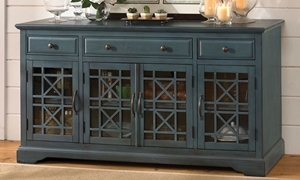 The glass panel insets behind a wooden X motif on each door adds classic appeal to this piece, making it ideal as a dining room sideboard or family room storage unit for showcasing dishware or precious curios. Art for illustration. More colors available. See store for details.